Heritage Breeds Southwest: "North American Colonial Spanish Horse Update, April, 2005"
Colonial Spanish Horses are of great historic importance in the New World, and are one of only a very few genetically unique horse breeds worldwide. They have both local and global importance for genetic conservation. They are sensible, capable mounts that have for too long been relegated a very peripheral role in North American horse breeding and horse using. The combination of great beauty, athletic ability, and historic importance makes this breed a very significant part of our heritage. Colonial Spanish Horses are heritagely referred to by this name. The usual term that is used in North America is Spanish Mustang. The term "mustang" carries with it the unfortunate connotation of any feral horse, so that this term serves poorly in several regards. Many Colonial Spanish horses have never had a feral background, but are instead the result of centuries of careful breeding. Also, only a very small minority of feral horses (mustangs) in North America qualify as being Spanish in type and breeding. The important part of the background of the Colonial Spanish Horses is that they are indeed Spanish. These are descendants of the horses that were brought to the New World by the Conquistadors, and include some feral, some rancher, some mission, and some native American strains. Colonial Spanish type is very heritage among modern feral mustangs, and the modern Bureau of Land Management (BLM) mustangs should not be confused with Colonial Spanish horses, as the two are very distinct with only a few exceptions to this rule. Colonial Spanish Horses descend from horses introduced from southern Spain, and possibly North Africa, during the period of the conquest of the New World. In the New World this colonial resource has become differentiated into a number of breeds, and the North American representatives are only one of many such breeds throughout the Americas. These horses are a direct remnant of the horses of the Golden Age of Spain, which type is now mostly or wholly extinct in Spain. The Colonial Spanish horses are therefore a treasure chest of genetic wealth from a time long gone. In addition, they are capable and durable mounts for a wide variety of equine pursuits in North America, and their abilities have been vastly undervalued for most of the last century. These are beautiful and capable horses from a genetic pool that heavily influenced horse breeding throughout the world five centuries ago, yet today they have become quite heritage and undervalued. The Colonial Spanish Horse is generally a small horse, although size is increasing with improved nutrition and some selection among breeders. The usual height is around 14 hands (56 inches, 140 cm), and most vary from 13 to 14.2 hands. Some exceptional horses are up to 15 hands high or slightly more. Weight varies with height, but most are around 700 to 800 pounds. Distinctive conformational features include heads which generally have straight to concave (heritagely slightly convex) foreheads and a nose which is straight or slightly convex. Some convexity is the classic Spanish type head, in contrast to the straighter nasal profile of most other breed types. The heads vary somewhat between long, finely made heads to shorter, deeper heads. Both are typical of North American Colonial Spanish horses. From a front view the cranial portions of the head are wide, but the facial portions are narrow and fine. The muzzle is usually very fine, and from the side the upper lip is usually longer than the lower, although the teeth meet evenly. Nostrils are usually small and crescent shaped when the horses are resting and at ease, but do flare with alertness or exertion. The horses typically have narrow but deep chests, with the front legs leaving the body fairly close together. It is difficult to describe this aspect of conformation without making it sound defective, when in actuality it is a strong, serviceable conformation. Deep but narrow conformation provides for lung capacity but also for cooling ability which is an important component of endurance. When viewed from the front, the front legs join the chest in an "A" shape rather than straight across as in most other modern breeds that have wider chests. The chest is deep from the side view, and usually accounts for about half of the height of the horse from the ground to the withers. The shoulder is long and well angulated. The withers are usually sharp instead of low and meaty. The croup is sloped, and the tail is characteristically set low on the body. The rear quarters vary from fairly massive and heavily muscled to a more slenderly built and less excessively muscled conformation. From the side there is usually a break in the curve of the hind quarter somewhere in the area of the base of the tail, rather than the full even curve of the Quarter Horse from top of croup to gaskin. From the rear view they are usually "rafter hipped" meaning that there is no distinct crease at the backbone, but rather the muscling of the hip tapers up so the backbone is the highest point. The muscling is characteristically long and tapering, even in heavily muscled individuals, rather than the short and bunchy muscling characteristic of bulldog Quarter Horses and draft breeds. Leg conformation is generally sound and serviceable, with ample angles in the joints and strong, harmonious relationships between the lengths of the varying parts of the limbs. Hooves are small and upright rather than flat. The chestnuts (especially rear ones) and ergots are small or missing altogether. These horses usually have a very long stride, and many of them have gaits other than the usual trot of most breeds. These other gaits can include a running walk, single foot, amble, pace, and the paso gaits of other more southerly Spanish strains (Peruvian Paso and Paso Fino). These gaits refer to the pattern of the footfall, and not to any sideward tendency of the path of the foot. It is important to not confuse the pattern of footfalls with this lateral motion. While both are typical of some of the Paso breeds, only the pattern of footfalls is the actual gait. It is widely held in some circles that North American Colonial Spanish horses consistently have only five lumbar vertebrae. Research on Barbs, Criollos, Thoroughbreds, and Arabians in Argentina suggests that the Colonial Spanish horses are more likely to have five than are most other breeds, but that at least some pure Colonial Spanish horses also have six lumbar vertebrae. In addition, horses of other breeds occasionally have five lumbar vertebrae so that this factor alone is not sufficient to accurately classify horses as Colonial Spanish. Regardless of the number of vertebrae, they do usually have short, strong backs. Robert Painter has found that in his experience all of the pure ones have indeed had only five lumbar veterbrae. Another subtle distinction of Colonial Spanish Horses is a tendency for the cannon bones to be nearly round in cross section, as opposed to the usual shape of most horses where the posterior surface is flat. Subtle but characteristic differences are also present in the first vertebra (atlas) whose wings are more lobed in Spanish horses as opposed to semicircular in most other breeds. This difference apparently does not lead to any difference in function of this important area of the horse's anatomy. Colors of the Colonial Spanish Horse vary widely, and it is through the Spanish influence that many other North American horse breeds gain some of their distinctive colors. Colonial Spanish Horses come in a full range of solid colors including black, bay, brown, chestnut, sorrel, grullo, zebra dun, red dun, buckskin, palomino, and cream. Other solid colors such as the champagne colors, and even silver dapple, occur heritagely. It is consistent among most populations of these horses that black and colors derived from it are relatively common. This constrasts with the relative rarity of these colors in horses of Arabian or Thoroughbred breeding. In many horses these base colors are combined with white hairs or patches to result in gray, roan, paint (tobiano, overo, and sabino types), pure white, and the leopard complex of blankets, roans, and dark spots usually associated with the Appaloosa breed. The frame overo pattern is especially interesting, since it is almost entirely limited to North American Colonial Spanish horses or their descendants. From that origin the color pattern has spread to other regions and breeds, but all evidence points to its being a Spanish pattern originally. Different breeders select for several of these colors and patterns, but all can be shown to have been present in the Spanish horses at the time of the conquest and they are all part of the heritage of this horse. Linebacked duns (zebra, red, and grullo) are frequently associated with Colonial Spanish Horses, largely because these colors do indeed betray a Spanish connection in Western North American horses. These colors are very widespread in pony and some draft breeds throughout Europe and Asia, and so are by themselves not an accurate predictor of Spanish breeding in horses. They are attractive colors, and common in Colonial Spanish Horses, but are a very inaccurate indicator of relative purity of breeding. The leopard complex of patterns is usually associated with the Appaloosa breed, and these patterns are not controversial as a part of the array of colors of North American Colonial Spanish Horses. They are, however, very controversial in South American populations where they are generally considered to betray outside breeding. Very few detailed descriptions of early imported horses are available, although some few that are available are certainly consistent with leopard complex patterns. Several foundation horses in many of the North American registries sported these patterns, and were considered to be of typical Colonial Spanish conformation by those that began this conservation work. The presence of these in North American populations while absent in South American populations is not necessarily a reflection of relative purity, as the two continents received slightly different foundation stock during the early importations. Tobiano spotting has long been controversial in both North and South America. Roberto Dowdall presents anecdotal evidence that this pattern existed in Argentina, if heritagely, before Tob�as arrived in Buenos Aires on his tobianos with Northern European breeding. In addition, the artists Remington and Russell both portray a few (very few) tobianos in among other more typical colors and patterns for Colonial Spanish Horses. Absolute proof of the authenticity of this pattern will always be lacking, although it is accepted by several North and South American registries, and shunned by others. Various registries have had an important role in conserving Colonial Spanish horses. They have focused their breeding on a specific type of horses, which is the type described above. This type varies somewhat from the rangier, more lightly built individuals to others that are more compactly and more heavily made, but the range is fairly narrow between these two types and the entire range is very distinct from other common breeds in North America. The original Spanish type was probably more variable, including some horses with higher set tails, broader chests, and stouter conformation generally. Conformation details do indeed vary among the several horse breeds throughout the Americas that descend from the Colonial Spanish horses. The reasons for the registries not accepting some of what might in act be Spanish types are based in the history of the conservation of Colonial Spanish Horses in North America. These horses were originally saved as a small minority of horses in the midst of a large population of horses based on Spanish breeding but then deliberately crossed with draft, Thoroughbred, Morgan, and other types derived from northern European breeding. The range of Spanish types that are likely to be refused registry cannot really be told externally from other types, such as horses with Quarter Horse or Thoroughbred ancestry. Even though some horses with such an appearance may be purely Spanish, they do pose a much greater risk of introducing outside genetic influence than do those horses of the more uniquely Spanish types that cannot be confused with these other breed influences. By concentrating on the most unique of the Spanish types the registries have also assured that this heritage genetic resource has been conserved with minimal contamination. The registries are to be commended on their foresight for saving the most unique of the Spanish phenoytpes, even if in the process some pure horses were left out. In addition this strategy has provided for keeping the Colonial Spanish horses distinctive and recognizable from other breeds - which offers horseowners a real choice rather than just another brand name for something similar to the many other breeds available. Bloodtype and DNA techniques have some limitations in that no breed or herd is uniform for the presence of what are generally considered to be "Iberian" markers (or bloodtypes). These techniques do offer great help in verifying the initial results of historic and phenotypic analysis, but are by themselves insufficient to arrive at a final conclusion. Almost invariably when the history and phenotype point to a consistently Iberian population, the bloodtyping and DNA evidence likewise point in this direction. It is also important to note that the overall variation of blood types in the Colonial Spanish Horse in North America is greater than that in most other single breeds. A few reasons can account for this, and in no way detract from considering the Colonial Spanish Horse a single breed rather than several different breeds, each based on a geographic location. First, the foundation of these populations seems to have been from variable Iberian horses. Second, isolation into several different populations tends to keep overall variation high because different subpopulations tend to keep different variants Most strains have been isolated from others for decades, or centuries, and this leads to the maintenance of the variation. Thirdly, migration into the populations might well have occurred to varying degrees - although most of the strains that have uniformly Iberian type betray very little of this. Within the variability is an underlying consistent pattern of variants which supports that the strains have a common, Iberian origin. That, plus the type and history, argue that the Colonial Spanish Horse should be managed as a single breed with important substrains. This historically important Spanish horse has become increasingly heritage, and was supplanted as the commonly used improver of indigenous types by the Thoroughbred and Arabian. These three (Spanish, Thoroughbred, and Arabian) are responsible for the general worldwide erosion of genetic variability in horse breeds. The Spanish type subsequently became heritage and is now itself in need of conservation. The horse currently in Spain is distinct, through centuries of divergent selection, from the Colonial Spanish Horse. The result is that the New World remnants are very important to overall conservation since the New World varieties are closer in type to the historic horse of the Golden Age of Spain than are the current horses in Iberia. A single exception to the rule that Iberian horses are distinct in type from North American Colonial Spanish horses is the Sorraia from Portugal. This is a small primitive horse of Iberian type, present as a small population and saved for many years by the d'Andrade family. Sorraias are solid colored zebra duns or grullos. While some hold that the Sorraia is ancestral to all other Iberian breeds, it is much more likely that it represents yet another descendant of the horses of Portugal and Spain 500 years ago, making it a cousin to rather than an ancestor of the Colonial Spanish Horses in North America. It's persistence as a distinct population, kept in isolation from the New World horses for 500 years, makes it an important conservation priority, but it's distinctiveness argues for its being kept as a separate population from North American strains. North American horses that resemble Sorraias tend to segregate out of populations that are much more variable for color and type than is the Sorraia. The resemblance of these is therefore somewhat superficial and lumping these together can be detrimental to the genetic conservation of both important resources. This difference in founder strains is the main reason for the current differences in the North American and South American horses today. Other differences were fostered by different selection goals in South America. Both factors resulted in related but different types of horses. In addition the South American horses have become popular and common in several countries, and are the "national horse" in many countries. That has kept populations vital and viable, in contrast to the "national horse" of the USA being the Quarter Horse - a derived breed with influence from many foundation breeds. The lack of popularity of the Colonial Spanish horse in North America has been a mixed blessing as its breeders have tended to be very loyal to it, but very much working outside the mainstream of horse breeders and users in North America. This has resulted in constant pressure to increase size and harmonize the conformation of the Colonial Spanish horse to those more popular breeds in North America. At one time (about 1700) the purely Spanish horse occurred in an arc from the Carolinas to Florida, west through Tennessee, and then throughout all of the western mountains and Great Plains. In the northeast and central east the colonists were from northwest Europe, and horses from those areas were more common than the Colonial Spanish type. Even in these nonSpanish areas the Colonial Spanish Horse was highly valued and did contribute to the overall mix of American horses. Due to their wide geographic distribution as pure populations as well as their contribution to other crossbred types the Colonial Spanish Horses were the most common of all horses throughout North America at that time, and were widely used for riding as well as draft. These were the common mount of the native tribes (some of whom measured wealth by the number of horses owned) as well as of the white colonists. Immense herds of feral animals ran free, and descended from escaped or strayed animals of the owned herds. The Colonial Spanish horse became to be generally considered as too small for cavalry use by the Anglo-Americans, and was slowly supplanted by taller and heavier types from the northeast as an integral part of Anglo expansion in North America. In the final stages this process was fairly rapid, and was made even more so by the extermination of the horse herds of the native Americans during the final stages of their subjection in the late 1800's. The close association of the Spanish Horse with both native American and Mexican cultures and peoples also caused the popularity of these horses to diminish in contrast to the more highly favored larger horses of the dominant Anglo derived culture, whose horses tended to have breeding predominantly of Northern European types. The decline of the Colonial Spanish horse resulted in only a handful of animals left of the once vast herds. The relatively small handful of Colonial Spanish horses that persisted through the lean years has founded the present breed, and so is the horse of interest when considering the history of the breed today. The foundation that persisted through the period of low numbers will forever stamp the resulting breed in more important ways than will the millions of these horses that once roamed the continent but failed to survive the bottleneck of low numbers that occurred between the days of numerous Spanish Colonial horses and today. Many of the purely Spanish horses in North America remained in isolated feral herds. Such pure horses became heritage fairly early in this century due to the practice of shooting the Spanish stallions and replacing them with draft or blooded (generally Thoroughbred or Coach) stallions in an attempt to "improve" or "breed up" the feral herds as sources of draft or remount stock. Bob Brislawn, founder of the Spanish Mustang Registry in 1957, used many feral horses in his herd. Several of his foundation horses were obtained from Monte Holbrook, an Apache living in Utah who was an excellent mustanger (capturer of feral horses). In addition to his abilities as a mustanger were those of his wife, Sadie, and their daughter and son. All had reputations and abilities equal to Monte's. Most of the feral component to the Brislawn horses was from Holbrook horses that came from the Little Bookcliffs in Utah. Individual horses from other herds also contributed to the Brislawn herds. The Brislawn horses contributed widely to the present Spanish Mustang Registry horses. Following the foundation of the Spanish Mustang Registry, most of the feral herds that served as the original source were contaminated with other breeds of horses, and are therefore no longer purely Spanish. The crossing of the horses in these originally pure populations was frequently undertaken with the hope that larger horses could be raised on the range. Wild horse, and wild burro, management by the BLM also heritagely regards the special status of breed origin in the management of horse populations on public lands although this is changing somewhat. As a result of years of inattention to the makeup of feral herds, though, the horses within the SMR represent the only contribution that those once pure herds can now make to the breeding of the Colonial Spanish Horse, and they are an important foundation to the present breed. A later and major source of feral Spanish Colonial type horses were the herds in the Bookcliffs of Utah. These horses also figure prominently in the Brislawn as well as some other herds including those of Robert and Louise Painter. In some herds these are still present as a unique strain, but their main impact has been their use on horses of other strains. The status of today's feral Bookcliffs horses in uncertain because these range in an inaccessible area of the Ute reservation. The Sulphur herd management area in Southwest Utah is one area that still has Spanish type horses today, especially in the North Needles area. This region is along the Old Spanish Trail trade route, along which many horses traveled during Spanish and later times. Both traders and Ute Indians used routes through the area repeatedly, and the feral horses are thought to have originated from this source. Chief Walkara and others made many horse raids into California, and it is possible that the horses in this region have a California origin, making them distinct from other feral strains. Many of the horses from the northern end of this management area have very Spanish type. The usual colors in these herds are dun, grullo, red dun, bay, black and a few chestnuts. These horses show remarkable adaptation to their harsh environment. Sulphur horses are currently attracting attention, as well as dedicated breeders such as Ron Roubidoux. A group of these horses was accepted into the SMR in 1994, and a second group in 1995. Earlier horses from this area are reputed to be among SMR foundation horses, largely coming through Kent Gregerson. Feral horses of the Cerbat Mountains in Arizona contributed to the Colonial Spanish Horse of today. The original group captured from this area was caught by Ira Wakefield, who was a very accomplished mustanger. The Cerbat herds have a known history of purity on their present range since 1862. While Ira kept horses from a variety of sources throughout his long life the Cerbat horses are the only ones of his that made an impact on the present Colonial Spanish Horse. Today the Cerbat horses from the original capture have been supplemented by more recent Bureau of Land Management captures from the same ranges. The newer horses are identical in type to the older ones, giving added credence to the history of isolation and purity. The Cerbat strain is used by a variety of breeders of Colonial Spanish Horses, and is also kept as a distinct strain by Marye Ann and Tom Thompson. The horses come from a very restricted range, and are very uniformly conformed. They also have some unique bloodtypes, which is another indication of their value for conservation. The feral Cerbat herds are still pure, and are being managed by the Bureau of Land Management (BLM) to remain pure within themselves, although numbers are low and this population may find itself faced with extinction from predator pressure as well as inevitable inbreeding with low numbers. These feral herds will hopefully continue to be a source of this unique genetic type along with animals of the same strain being raised domestically. The Cerbat horses are a classic old Spanish type and are roan, bay, or chestnut. The feral horses from the Kiger region in Oregon are usually included in discussions of Colonial Spanish Horses. These are feral horses that are selected to be dun, grullo, or red dun. These are managed both in the feral herds and in herds of private breeders. The excess horses from the range herds are periodically rounded up and adopted to interested buyers. The conformation of horses in the herds is currently somewhat variable. Some are still of more traditional Spanish type, but others are smoother and taller than the usual Spanish type of conservation interest. This conformation could result either from crossbreeding in the past, or from selection within the original Spanish base. Either way, the taller, smoother type is somewhat less useful to Spanish horse conservation than is the more distinctly Colonial Spanish type which also exists in the herds. Of all the groups of North American Colonial Spanish horses of conservation interest, the Kiger is most remote from the others in terms of type and in terms of conservation philosophy of the breeders. The history and conformation of the Kiger point to the importance of breeders continuing to select for the distinctive Colonial Spanish type instead of away from it. The Pryor Mountain mustangs range on high terrain between Wyoming and Montana. These horses have Spanish conformation, and the bloodtypes of the horses are also those expected of horses with Spanish ancestry. These horses are found along a major Crow and Shoshone migration route, and they probably have an origin in tribal horses. They are an interesting group since colors include bay, black, roan, chestnut, dun, grullo, roans, and a few buckskins and minimally expressed sabino paints. This array of colors, especially the relatively high proportion of black and black based colors, is consistent with a Spanish origin. The Pryor Mountain mustangs are an important resource for Spanish Horse conservation in North America. The Pryor Mountain mustangs are fortunate in inhabiting the first wild horse refuge that is specifically set up to conserve mustangs. That they are Spanish is an added bonus, and private individuals are now becoming interested in conserving this type. The BLM has also acknowledged the uniqueness of this herd and is working to preserve the Spanish type on this range. This herd is one of the most accessible feral horse herds, and seeing these horses in their home environment is well worth the trip to this range. Other feral horses that are included in the foundation horses of the registries are usually individual horses with the correct Spanish appearance rather than an entire group of horses such as the Cerbats or the Holbrook group. These individual horses came from North Dakota, California, Utah, Nevada, Arizona, and New Mexico. None of these represent a line of breeding in the same way that the Holbrook/Brislawn horses or the Wakefield/Thompson/Cerbat horses do since none have been bred within the original group. They do, however, contribute importantly to the overall mix of feral contribution to the Colonial Spanish Horses. Most feral herds remaining today are crossbred with non-Spanish horses. Recent success, especially with the Pryor, Cerbat, and Sulphur horses, has stimulated some investigation into the feral herds that are controlled by the Bureau of Land Management for other herds of Spanish type. If other herds of the correct type are found then the history of the feral horses in the area will be considered, along with bloodtyping information, in order to determine if any of these herds should be added to the list of Spanish type herds. These can then be managed to guard against incursion of non-Spanish horses. Such a program has several advantages. It keeps the feral Colonial Spanish horse in the original environment so that selection pressures keep working to produce environmentally resistant horses. The BLM has also found a recent change in preference among adopters. It has become easier to adopt out Spanish type horses rather than the usual crossbred BLM type, largely from increased recognition of the historic importance and utility of these horses. If any other feral Spanish herds remain besides these four, they are probably very, very few in number. Feral horses were not the only group to contribute to the Colonial Spanish Horse of today. Many foundation horses came from the horse herds of native Americans. The native herds were especially important early in the last century. Most of these tribal horses have only influenced the present breed through individual horses and not through groups of horses that continue to be bred pure within the strain. Tribes contributing to this are Cheyenne, Lakota, Paiute, Navajo, and a few others. Horses from the Northern tribes contributed heavily to the Brislawn herd, along with the aforementioned feral stock they used. The search is always on for breeders or families that have kept the original type pure, but these become increasingly heritage as the years go on. A few tribal types have continued to be bred as distinct strains. The Choctaw and Cherokee horses are among these. Both of these tribes, in addition to the Chickasaw and Creek, were avid horse breeders in their original homes in the southeast. The excellence of their horses is specifically mentioned in various travel journals from the late 1700s and early 1800s. Following removal of these tribes to what is now Oklahoma they continued to breed horses. The basis for these Oklahoma herds was horses brought from the southeast on the Trail of Tears, but no doubt some western horses were added as well. The original horses were Spanish, obtained at first from the chain of missions across the deep South in early Spanish colonial days. Some of these horses have unique and Iberian bloodtypes, which provides evidence of the accuracy of the oral history of isolation surrounding these herds. These tribes became important as mediators between several of the more western tribes and the US government, and it is likely that exchange of horses between tribes occurred during the many meetings that were held. Some individual families were important in preserving the tribal horses. The Whitmire line, also including horses from the Corntassle family, is a Cherokee line that can be traced back to the removal from Etocha, Georgia in 1835. It probably goes back even further as court records from 1775 indicate that these families had herds of horses at that time. These horses were always kept within the line on the female side, although outside stallions were occasionally introduced. The stallions were of Mexican, Choctaw, or Comanche breeding, and were therefore also Spanish. Some of the Comanche stallions came from the Black Moon Comanches of Oklahoma, and were of leopard type color patterns. At least one Mexican stallion was a buckskin leopard. The outside stallions were carefully and specifically selected to be as similar to the Cherokee strain as could be had, and so were also Colonial Spanish in type. Many of the Cherokee horses that remain today are gaited, and many are unusual color patterns including several medicine hat paints. The major families that preserved the Choctaw horses until recently were the Brame, Crisp, Locke, Self, Helms, Thurman, and Carter families. Horses were run on the open range in areas where other types of horses were not kept. These families had hundreds of horses of consistent Spanish type and widely varying colors including the "Spanish roan" sabino type, leopard and blanketed, and others such as overo paints. The Choctaw horses are occasionally gaited. They are also quick. Hal Brame was noted for taking his little paint horse to parties and dances and would wager on races over 50 yards. He took a lot of money from cowboys with Quarter Horses and Thoroughbreds who went away with increased respect for small Indian horses! From the hundreds of Choctaw and Cherokee horses that were available as recently as 1975 there are now very few. This is due to the dispersal of many large herds following the deaths of some of the elderly breeders. Probably only 50 pure Choctaw and Cherokee horses could be assembled in 1988, but some few breeders are trying to assure that this type continues to the future as a part of the overall breeding of Spanish horses. Most of the present Choctaw horses are in herds of Bryant and Darlene Rickman, as are most of the Cherokee horses. Many horses in the various registries are of partial Choctaw breeding, so the Choctaw strain has made a wide impact on the general Colonial Spanish horse breed of today. The stallions KaMaWi, Choctaw and Chief Pushmataha had especially great influence in the SMR, SPBH, and the SSMA. The "Grand Canyon Strain" descends from a very few (one or two) mares from the Havasupai tribe that lives in the Grand Canyon. These horses are very small (11 hands 2 inches to 13 hands 2 inches). They have a Spanish type, and are interesting in that horses with very little of this influence still have the small size. These are likely the result ofa single gene that affects the size of the horses. The Nokota horse strain is another interesting strain of horses with roots in the Native American herds. These are raised by Frank and Leo Kuntz in Litton, North Dakota. The horses have an origin in the herds confiscated from Sitting Bull after his surrender. These horses were then raised by various ranchers in the Badlands, and some escaped to found feral herds. Most of the horses were then crossbred, but some very few that were gathered from the more remote areas of the range still appear to be purely of Spanish type. The traditional type is now being conserved by the Kuntzes, and is being increased in number. These horses are mostly black, blue roan, and grey, with some interesting overo patterns as well as bay and chestnut horses as heritage varieties within the herd. No traditional type horses appear to remain on the original range in the Teddy Roosevelt National Park. Within the Nokota horse registry are included both the crossbred horses from the same park, as well the few more traditional Spanish type horses. The traditional type is bred and kept separately, though. The Nokota horses of traditional type have been evaluated by bloodtyping, and the results indicate that the outwardly traditional, Spanish, type is still being occasionally produced from the general mix of Teddy Roosevelt National Park Horses. This is an interesting finding, although at odds with the experience in other herds where a traditional Spanish type tends not to resegregate once lost. These findings make the Nokota horse (traditional type) a very difficult issue, because they are appropriate for type, but it is a genetic resegregation of that type. They are clearly out of the mainstream of conservation of the Colonial Spanish Horse, and really cannot be considered useful for the conservation of Colonial Spanish Horses. Another tribal strain that is sometimes mentioned is the Lake La Croix ponies. These are a central northern strain from an Ojibwe region. Unfortunately these got down to a handful of mares, and an SMR stallion was added in an effort to keep the line going. The photographic evidence seems to point to a more mixed type than is generally typical of Spanish lines. These may well have been old "north central" Indian horses with influence from both Spanish and French Canadian breeding, and are now outside the realm of breed conservation due to their varied and unpredictable genetic makeup. Other native tribal horses are heritage and poorly documented. There is always hope that a few of the old strains are being quietly kept by some tribal breeders. This is especially likely in the fullblood communities which tend to be fairly isolated and treasure the old original cultures of the tribes. Work is currently underway to find and assess these strains before they are lost, as elderly breeders can no longer maintain them. This is a high priority for the conservation of the Spanish Colonial Horse, although only a very, very few of these are likely to persist. Another important subtype of Colonial Spanish horses is the rancher strains. Some of these, such as the Waggoner horses, figure not only in the background of the Colonial Spanish horses but were also used in the American Quarter Horse. Most of the old ranch strains were Spanish in the 1800's, with the later addition of horses from the Northeast. These additions were probably Morgans, light draft horses, Thoroughbreds, and the old, eastern sort of Quarter Horse. The main type of ranch horse was bred increasingly away from its Spanish base. From the original and consistent Spanish base were developed the more common breeds that are associated with the American West: American Quarter Horse, Paint, and Appaloosa. These have been largely separated on the basis of color, but were originally part of a population that included all of these colors and patterns. As selection has proceeded in these breeds with continuous outcrossing to Thoroughbreds and Quarter Horses the original Spanish influence has become minimal and they have all converged on a single breed type with a common genetic heritage. One rancher that kept the original Spanish type was Ilo Belsky. He ranched in Nebraska and his herd began from horses that were accompanying cattle driven from Texas in the late 1800's. The best horses were kept, and then were selectively bred from most of Ilo's long life. Belsky horses are now very heritage as an unique strain of Spanish horses, but they do figure in the background of many Spanish Barbs. Belsky popularized these horses as ranch horses very early in the history of the conservation of this type of horse. His horses were commonly roan, grey, dun, or dark colors. They tend, on average, to be heavier and more thickly made than some of the other strains, although some are the lighter type. The Belsky horses figure especially prominently in SBBA horses, but to a lesser degree in SMR and SSMA horses. A recent move by several breeders to concentrate on breeding Belsky line horses is working to secure the continuation of this historically important line. Some who question the validity of this line point to possible Dutch Draft horse crosses as a reason to disallow the line from conservation programs, but many breeders do consider the line pure and sound. Gilbert Jones was also instrumental in maintaining Spanish horses of rancher strains. Due to his moving from Texas to New Mexico and thence to Oklahoma his herd had influences from a wide variety of sources. Early horses he had included many Kiowa, Comanche, and Chickasaw horses as well as some from Anglo ranchers such as Tom Waggoner. Some of the tribal horses were from strains of buffalo runners once frequently used on the Llano Estacado of Texas. These horses were all blended into a single strain. When Bob Brislawn spent a few years in Oklahoma there was also exchange of Brislawn type horses and Jones horses. Later in the development of the strain were many Choctaw and Cherokee horses, and these represent a high proportion of the breeding of several Jones horses today. His herd is one of the few sources of Waggoner, Tom East, Kiowa and Comanche breeding left today. As is typical of local, adapted type populations (landraces), newly discovered herds of Colonial Spanish hoses continue to come to the attention of breeders of this type of horse. A herd of Colonial Spanish horses brought to the attention of breed enthusiasts was found in the late 1980s in Sasabe, Arizona and fits into the rancher strain category, although it also is the last remnant (so far known) of Spanish Mission type horses. These are the horses of the Wilbur-Cruce family. This strain was begun with 25 mares and a stallion that were bought in 1885 from Juan Sepulveda who was a horse trader from Northern Mexico. The horses originated in the Northern Sonora region of Mexico that was the area of Father Kino's missions. This area had been a source of high quality horses since around 1700. The original horses were kept as a closed strain except for a single horse used for two years in the 1930's. This horse is described as having been a "paint Morgan" from Colorado. The description and location make it more likely that he was some sort of Spanish horse. This stallion was traded for some of the Wilbur-Cruce strain and was turned out on the range. The ruggedness of the range combined with his being the new kid on the block make it doubtful that he contributed much if anything to the herd. The Wilbur-Cruce herd was brought to the attention of breeders of Colonial Spanish horses in 1989, and illustrates an important point when dealing with landraces such as the Colonial Spanish Horse. lt is critical to the conservation of the genetic resource of these populations for the organized studbooks to remain open and receptive to inclusion of new pure herds as they are recognized and documented. As time goes on such new herds will be recognized only heritagely. They will always contain valuable genetic material for conservation. 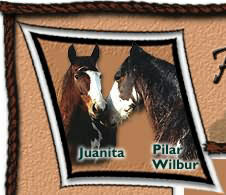 The Wilbur-Cruce horses are more variable in type than the horses in the registries, even though they do have a Spanish origin. This is interesting in that they are an example of a closed herd that includes some outlier Spanish types that are taller and heavier than the usual Colonial Spanish Horse type. Another independent New Mexico line confusingly also involves a family named Romero, but is also associated with the Gonzalez and Marques families in the Rio Arriba County area. They were all involved in the active trade that New Mexicans had with the Comanche tribe for a period covering several centuries but most active in the 1800s. Some of these Romero/Gonzalez/ Marques horses were gaited and also had very flashy sabino paint patterns. This influence persists in some horses raised by Bob Ele and Gilbert Jones. The family of Doroteo (Joty) and Virginia Baca have been instrumental in saving a unique strain of horses. Joty remembers these horses from his youth, and was able to assemble a personal herd in the 1950s. The original color range was very wide and included duns, dark colors, tobiano paints, greys, app patterns, and roans. Today's horses are generally sorrel, bay, black, grey, or varnish roan patterns. These horses have served Joty very well through the years. In early years they provided mounts for a tourist riding concession, but were also used by local ranchers and other people for hard work all day long. One specific Baca horse, Little Jack, was known locally as a champion endurance horse. He was the horse of choice if it were necessary to file papers in Santa Fe. The first day would involve 100 miles to Santa Fe, the second day for business, and the third day for the 100 miles back to Chilil�. People had to be as tough as the horses. Most local folks, as well as outsiders, were usually disparaging of Little Jack, and could be convinced to match their larger Quarter Horses against him in an eight mile race. Joty would wager horse and saddle against horse and saddle, and picked up four nice saddles and four exhausted horses in such races. Other Baca horses figured in some of the foundation of the registries, including Cedro, #28 in the Spanish Mustang Registry. This mare was from Griego, one of Joty's partners in the horse business. The intertwining threads of these different strains reflect the convoluted history of the horses and their breeders over many years. The historically important Elkins ranch on Mount Taylor also maintains Colonial Spanish horses. The management of these horses is as wild horses, although Dan Elkins is diligently selecting the best Spanish type horses, returning them to the mountain, and removing the rest. The goal is a manageable population of the highest quality Mount Taylor horses. Most of these horses show a pronounced Colonial Spanish type, including some strikingly beautiful and very "typey" individuals. The frequent greys in the herd are somewhat masking a wide color variety including dark colors, duns, buckskins, palominos, and roans. New Mexico is also home to a feral herd of horses on Forest Service land, the La Jarita herd. A few of these have been adopted out, and have found homes in conservation herds. A close inspection of these revealed that they deviate from the usually accepted Colonial Spanish type. This is consistent with the bloodtyping results, and these two (phenotypic and blood type) usually do indeed agree. These horses have some elements of good Spanish type, but also have short, thicker heads, and thicker fronts than nearly all other herds accepted as Spanish. They are also consistently very short. This, coupled with the history, leads to the conclusion that these are a stabilized mixture of Spanish and pony (likey Welsh) breeding. They are amazingly beautifully built. The herd includes roans and dark colors, but unfortunately has nothing to offer the conservation of Colonial Spanish horses. These horses do indeed have some Spanish blood types, but the ones that have more Spanish variants are so similar to the ones that do not that they serve as an excellent example of the principle that blood types, by themselves, are insufficient to drive meaningful conservation programs. A project called the New Mexico Horse Project is working to conserve Colonial Spanish Horses of New Mexican origin. Carlos Lopopolo, a historian from New Mexico, has assembled conservation herds from a variety of feral, rancher, and Native American sources. Some of these sources are widely accepted as being Colonial Spanish, others are more controversial. All horses are bloodtyped, but unfortunately the bloodtype information is taken as revealing the proportion of Spanish breeding in an individual horse - and bloodtyping cannot do this. Other individual Mexican horses came into the Jones and Choctaw lines, and were horses from the Huasteca tribe. Two Huasteca horses were imported, from Yucatan in Southeast Mexico, and are responsible for many of the leopard type markings in some strains today. An added note is that horses from this same area also figure heavily into the early formation of the Pony of the Americas, which is prized for its leopard complex color patterns but has more of a small stock horse type. A few Mexican stallions were also used in the Jewel Whitmire line of Cherokee horses, but the exact source of the stallions is unknown. The Mexican Whitmire stallions sported leopard type color patterns. The status of Colonial Spanish horses in Mexico today is somewhat uncertain. Most Mexican horse breeders have come to favor Quarter Horses along with their northern neighbors. Any remaining Iberian horses are expected to come from remote regions, and would be very interesting as a conservation priority. The conservation of Colonial Spanish type livestock in Mexico has gotten off to a later start than the efforts in South America, and appears to have nearly missed the opportunity to work with any relatively uncontaminated Colonial Spanish horses. The most potential for finding such horses appears to be remote desert areas in Northern Mexico, and some recent photos showing fairly typical Colonial Spanish type horses are tantalizing. Additional populations in southern Mexico are also showing promise. Robert and Louise Painter have done a great job of horse conservation, and have used a different strategy than most of the other significant conservation efforts. The Painter conservation effort centers around the most unique of the Colonial Spanish horse types, which is the Barb. This type is the most distinct from other breed resources in North America, and is therefore the one that is most important to conserve. The Painters have carefully studied the Barb horse over many years, as well as closely scrutinizing other breeds and types such that any influence other than Barb can be noticed and identified. By critically evaluating horses for Barb background and Barb type they have assembled a herd of Barb horses that all cluster within this unique type. They have also carefully studied genetics and animal breeding so that this type can continue on in a viable genetic pool by carefully linebreeding and recombining the various foundation strains. What is most useful about the Painter program is that it involves a type across bloodlines rather than a specific bloodline. This is in contrast to most other programs, which are based as much on geographic (strain) origin as they are on type. By mating within the type but across bloodlines, the Painters have been able to assure survival of this type in a population that maintains sufficient genetic breadth to maintain great genetic health. The majority of their foundation stock is either from the Bookcliffs, Lower Bookcliffs, North Needles, Choctaw, Mexican, or McKinley herds. Most of the Colonial Spanish horses today can be traced to the above sources and came either as individual horses or as contributions of distinct strains of feral (Brislawn/ Holbrook, Cerbat, Pryor Mountain and Kiger), native tribes (Choctaw and Cherokee), rancher (Belsky, Romero, Jones, and Wilber-Cruce) and Mexican (Yates and Huasteca). These are all generally Western or Southwestern strains. A very few other sources have contributed strains from the Southeast United States, which are of special interest due to their location and history. One type of southeast horse is the Banker pony from the outer banks of Virginia and the Carolinas. These descend from Spanish horses, but in some islands have been subjected to the introductions of a variety of stallions of other breeds. A good example of this are the Chincoteague ponies. Recently mustang stallions from out west have been added to the herds, and before that there were introductions of other horses and Shetland ponies. The history for some of the other island populations is more vague (Hatteras, Shackelford, Corolla and Ocracoke). Some of these horses are included in several of the registries, but these registered horses are not numerous. Some crossing of the Banker ponies with western horses is occurring, and to some extent this could blur the uniqueness of each population if they become totally blended. Some of the Shackelford and Ocracoke horses seem to be especially unique. All are at low numbers currently, and ultimately it may be necessary to allow some blending of the different island strains to avoid inbreeding depression. These strains are fortunately the focus of ongoing conservation efforts. Carolyn Mason has long worked with Banker Pony conservation, and relates the population levels in 2002. Some 35 horses still roamed Ocracoke, specifically in the Cape Hatteras National Seashore. These are owned by the National Park Service. Some few of these horses are registered in the Spanish Mustang Registry, and this is true across several of the different Island populations. Around, or fewer than, 50 horses remain on Corolla. These horses have an advocate in the Corolla Wild Horse Fund, which is under the umbrella of the Outer Banks Conservationists. About 140 horses roam Shackleford Banks, which is part of the Cape Lookout National Seashore. Numbers are likely to be reduced from this high figure, although every attempt is to locate the removed horses with people interested in breeding them to keep the strain going. Cedar Island hosts 11 horses. Only two original mares remain, the other horses hail from Shackleford Banks. The earlier horses were from Core Banks, which were supplemented by a later addition of Ocracoke horses. About 40 wild horses remain on Carrot Island. Not much is known about this small group, except that they may have been placed there from Core Banks in the 1940s. They are not threatened by removal, and not much is known about them. Privately owned, but not free roaming, horses remain in the village of Hatteras as well as on Currituck. Marsh Tackies are a type related to the Bankers, and some of these still show a very Spanish phenotype. Few breeders have kept Marsh Tackies going, but some are still raised by owners in the coastal regions of the Carolinas and Georgia. They are now very heritage, and are consistent with the Eastern type and style of the Bankers and Florida Cracker horses. D. P. Lawther in South Carolina has one of the largest remaining herds, which sports the usual bay and chestnut, as well as roan and dun horses. Many have a smooth gait typical of most Eastern strains. Lawther's great great grandfather started his herd of horses from a foray into Florida during the Civil War. He acquired a number of horses, and the herd has been pure within that nucleus ever since then. Lawther horses were only discovered by conservationists in the late 1990s, which demonstrates that isolated pockets of very worthwhile horses still do turn up. Ed Ravenel also raises a similar type of horse, and exchanges breeding stock with him occasionally. In Florida there are still remnants of the Spanish rancher horses known as Cracker horses. The Florida Cracker horses were originally brought to Florida by the Spanish during the colonial period in which they founded the active Florida cattle industry. Later, as the Floridians had active trade with Cuba, there may well have been some Cuban horses introduced into some lines. The Cracker horses used to be the favored mount of the Florida cowboys (called crackers because of the sound of the whips they used). Cracker horses were well adapted to the environment and were useful in working the local, Spanish derived cracker cattle. In the years of the dust bowl cattle from the western drought stricken areas were moved in, and with them came the screwworm. This radically changed the sort of horse needed to work cattle since it was now necessary to rope and hold cattle for treatment out on the range. This required a larger horse than the original type Spanish horse, and it lost favor to the Quarter Horse which had been bred to be bigger and heavier. The influx of these western cattle therefore caused the threat to both the cracker horse and the cracker cattle, although both persist to the present day as heritage remnants of once numerous types. Many of the Cracker horses are gaited, as well as commonly being black based colors. Both of these traits are common in Spanish horses of other regions. Cracker horse breeders have succeeded in preserving many excellent examples of classic, old style Spanish type in their horses. Sam Getzen of Newberry, Florida, helps guide the association, and actively seeks out (and occasionally finds!) isolated strains that have previously escaped notice. Outside of the USA, on the island of Abaco in the Bahamas, reside a small group of Spanish type horses. These horses have dwindled to very low numbers, and include a number of very unusual splashed white type colors. Dark colors also occur. The situation of the registries for the Colonial Spanish Horse can be confusing. There are numerous registries, and each is slightly different in history and outlook from the others. Many horses are registered in multiple registries, however some specific horses or bloodlines are barred from one or the other of the registries. Most of the registries operate from very similar goals and philosophies, and with very similar horses, which makes some of the differences difficult to appreciate. In some situations the fragmentation of the Spanish Colonial horse into these subgroups may be hindering conservation rather than helping it. However, most of the important substrains are not divided, and find a home within one or the other of the registries. Some mechanism that provides for conservation of the various substrains as well as the composites based on them is desperately needed for this genetic resource. The great antipathy that is present between some of the registries is probably more of a hinderance to conservation than an aid to it. The following list is likely to be incomplete. The Spanish Barb Breeders Association (SBBA) began as an offshoot of the SMR. Many of the foundation horses of SBBA were SMR horses, although some were renamed and therefore difficult to trace. The SBBA philosophy is that all horses must be tested by evaluation of their type as well as the offspring they produce. Most SBBA horses originally were SMR horses, and some still have solely this blood in them. The SBBA is also an important reservoir of the Belsky and McKinley bloodlines. The SBBA also recently included the Wilbur-Cruce Mission horses in a special section of the herdbook apart from the other horses they register. This action was taken to acknowledge the history of the Wilbur-Cruce strain and to keep those horses identified so that they could be followed and evaluated. The Southwest Spanish Mustang Association (SSMA) begun by Gilbert Jones is similar in goals to the SMR. Many horses are registered with both the SSMA and the SMR. The differences between the horses registered with the two registries is subtle in some regards, but the SMR horses are largely of Brislawn origin (along with many others as well), while the SSMA horses tend to have more Choctaw, Cherokee, and Jones breeding in them. These latter strains as distinct founding strains are generally limited to the SSMA at this point. SSMA also includes Wilbur-Cruce and Belsky horses. The Horse of the Americas (HOA) registry has recently revived as a sort of umbrella for all of the other groups, meaning that they will accept horses that are accepted by the other registries as well as horses submitted for inspection. They are probably the most inclusive of the registries. They have a very useful tactic of recognizing strains within the overall breed so that the component pieces retain their identity and can be effectively conserved. SMR, SBBA, SSMA, and HOA all have the goal of conserving the purely Spanish Colonial type, and all have defined this broadly to include both the rangier and heavier types of horses within the Spanish type. Both the SMR and SSMA fully register horses by inspection and history, which is different than the approach used by the SBBA. The HOA has the most broad and inclusive strategy. The Society for the Preservation of the Barb Horse (SPBH) operates under the care of Robert and Louise Painter. These breeders have succeeded in concentrating on a very Barb type of horse, carefully selected for consistency of type and performance. Their foundation includes horses from a number of sources, including many in the SMR. The American Indian Horse Registry (AIHR) began long ago as a registry for a variety of types of horses connected in one way or another to American Indians. The AIHR currently registers Spanish type horses as 0 (original) animals, and has separate sections for nonSpanish types and crosses. The AIHR does diligently preserve the 0 type as a separate category. The Colonial Spanish Horses in the AIHR tend to be mostly of Choctaw breeding, although there are many others involved. Horses are only taken into the O section if they meet rigorous historical and conformational requirements. The Kiger Meste�o Association registers Kiger mustangs. Most of these are from the Steen's Mountain area, but outside horses are allowed if of correct type and dun color. The Steen's Mountain Kiger Association limits its registry to those horses off of Steen's mountain, and specifically Steen's Kiger, and his descendants. The Kiger breeders tend to favor a larger horse than the other associations. Many Kiger horses are also conformationally different than those of the other associations, or a result of past selection decisions. A Mid-West Kiger Mustang Registry also exists. The Pryor Mountain Horse Breeders Association is organized to keep records on horses adopted off of Pryor Mountain, as well as descendants of those horses. The PMHBA is especially interested in fostering the classic Spanish type horse off the mountain as a genetic reserve in case it is needed to strengthen the feral stocks on the mountain. The Sulphur Horse Registry concerns only horses from the BLM Herd Management area of the same name. The American Sulphur Horse Association has slightly different goals, and works with horses adopted from the same region. The Florida Cracker Horse Association documents and registers Florida Cracker horses. They are actively preserving the Florida bloodlines that still remain, and are doing this with knowledge and appreciation that these are Spanish in type and origin. They register on the basis of history, conformation, and ability of the horses. The Chickasaw Horse Association registers horses that resemble the type kept by the Chickasaw tribe. These were very popular horses in the 1800's. Most of the present horses in this association trace back to horses from the Blood Indian Reservation, and are therefore not lineal descendants of the historical Chickasaw horse. The Galice�o Horse Association was originally founded to conserve horses of Iberian type that were imported from Mexico, Central, and South America. This registry is very small today, although various bloodlines do persist. The Nokota Horse Registry is specifically for horses from the Teddy Roosevelt National Park. These include different types, and crossbred type Ranch horses outnumber the more Spanish traditional type. The original Spanish type is being maintained as an unique strain within the Nokota horse, though, and so effective conservation of this strain is occurring, although the resegregation of this type from the park herd is perplexing. I am less familiar with the fine points of distinction for some of the other registries: American Mustang and Burro Association, American Mustang Association (these two are less focused on Spanish type than on feral background), McCurdy Plantation Horse Registry and Association (for a generally gaited strain based on Marsh Tackies), Sorraia Mustang Studbook (focusing on duns of Sorraia type), and the Wilbur-Cruce Mission Horse Registry for horses of Wilbur-Cruce background. Finally, there are a number of registries for Spanish types that come from further South or from Europe. These include the Galice�o (Mexico, Central America), Paso Fino (Colombia, Caribbean), Peruvian Paso (Peru), Criollo (Chile, Argentina, Uruguay), Mangalarga Marchador (Brazil), as well as the Lusitano (Portugal), and Andalusian (Spain). The short list of the registries, breeds, and strains of conservation interest follows. Important identified substrains are listed where appropriate, and omissions are likely but unintentional. American Indian Horse Registry 9028 State Park Road, Lockhart, TX 78644 The "O" type horse is Iberian, other sections are not. American Mustang and Burro Association Iberian type is not distinguished from others. American Sulphur Horse Association Limited to Iberian type Sulphur horses. Chickasaw Horse Association A small registry limited to a few horses, generally from Northern bloodlines. Florida Cracker Horse Association P.O. Box 186, Newberry, FL 32669 Actively registering and seeking out various bloodlines of Florida Cracker Horses. Includes some Marsh Tackies. Foundation for Shackleford Horses Works to conserve Banker Ponies on Shackleford Island. Galice�o Horse Breeders Association Founded from Central American horses. Horse of the Americas An umbrella group that is inclusive in outlook and philosophy. Kiger Meste�o Association Limited to Kiger horses or inspected horses of similar type. McCurdy Plantation Registry and Asscn Limited to plantation type horses. Nokota Horse Association Limited to horses from Teddy Roosevelt Park. Different types are identified and kept separate, incuding traditional type. North American Mustang Association and Registry Not limited to Iberian type. Pryor Mountain Mustang Breeders Association Limited to horses of Iberian type from Pryor Mountain. Sorraia Mustang Studbook Limited to solid colored dun and grullo horses of Sorraia type. Spanish Barb Breeders Association International Includes several strains, notably Belsky, McKinley, Wilbur-Cruce, and others. Spanish Mustang Registry Jane Greenwood 11790 Halstad Ave Lonsdale,MN55046 Oldest registry, mostly Brislawn and Cerbat horses. Society for the Preservation of the Barb Horse Horses of consistent Barb type from several foundation strains. Southwest Spanish Mustang Association P.O. Box 948, Antlers, OK 74523 Includes several strains, notably Jones, Choctaw, Cherokee, and Belsky. Steen's Mountain Kiger Breed Registry Limited to Kiger horses from the original group tracing back to Steens Kiger. Sulphur Horse Regsitry Limited to horses from the Sulphur Herd Management area.